NEGAUNEE — After being dominant throughout its first four games, the Negaunee-based Iron Range team had just enough left to pull out a 4-3 victory on Sunday night over the Michigan Ice Hawks in the championship game of the Michigan Amateur Hockey Association’s Midget 18-under BB youth hockey state finals tournament held at the Negaunee Ice Arena. 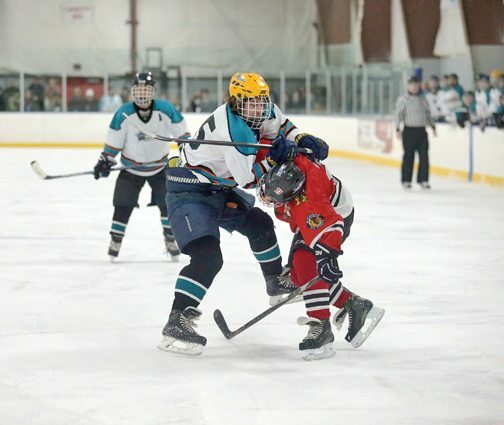 A Marquette team didn’t fare quite as well at the 16U B state finals tourney held at Lakeview Arena in Marquette, while a second Marquette team couldn’t advance past pool play in the Bantam 14U AA Tier 2 state finals held in the Detroit area. The Iron Rangers outscored their three opponents 26-2 in pool play on Friday and Saturday, then seemed to easily dispatch the St. Ignace Saints 5-1 in a tourney semifinal played Sunday afternoon. But meeting up with the only other undefeated team made for a classic matchup in the finals. It was reported that Eric Hurst scored the game-winning goal in the third period. The Detroit-area Ice Hawks outscored their pool opponents 18-7 and defeated the Tawas Blackhawks 4-2 in their semi, so Negaunee knew it would face its stiffest test in the finals. Other details weren’t available on the Iron Range’s Sunday games. Marquette Main Street Pizza-Bjork & Zhulkie insured its passage to the semifinals with a pair of Saturday wins, then defeated the champion of the other pool on Sunday morning, the Detroit-area Metro Junior Jets, with a 5-2 victory. In the finals, the Westland Blazers defeated Marquette 4-0. Like Marquette, Westland compiled a 2-1 pool record. At the Bantam 14U AA Tier 2 tourney, American Legion Post 44 of Marquette went 1-2 despite finishing with a positive goal differential. Legion lost to the Traverse City Northstars 3-2 on Friday evening before losing to the Troy Sting 2-1 on Saturday morning. The Marquette team bounced back for a 6-0 win over Motor City Machine in its final game Saturday night. The Troy Sting won its pool with a 3-0 record and reached the championship before falling to the Chelsea Chiefs Gold 7-2 on Sunday evening.